Workshop equipment specialist, P.J. Fallon & Son now stock the full range of Beta tools, workwear and footwear. 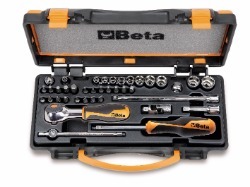 The Beta Automotive tools range includes a number of different products such as containers and assortments, wrenches, sockets and accessories, pliers and nippers, pullers, torque wrenches and multipliers, screwdrivers, male-end wrenches and bits and robur wire rope accessories. The Beta workwear line is distinguished by fashionable designs, high quality material, thorough knowledge of workers’ practical needs and an excellent quality/price ratio. The workwear line includes lightweight overalls, canvas overalls, waterproof sleeveless jackets and mutipocket work trousers. The success of its products has translated into the ongoing development and expansion of the range. Call P.J. Fallon & Son on 090 662 6963 or visit www.pjfallon.ie for more.